Complex Post-traumatic Stress Disorder is a not a diagnosis in the DSM-5 psychiatric manual, released in 2013, but is proposed to be included in the ICD-11 diagnostic manual, due for release in 2017. 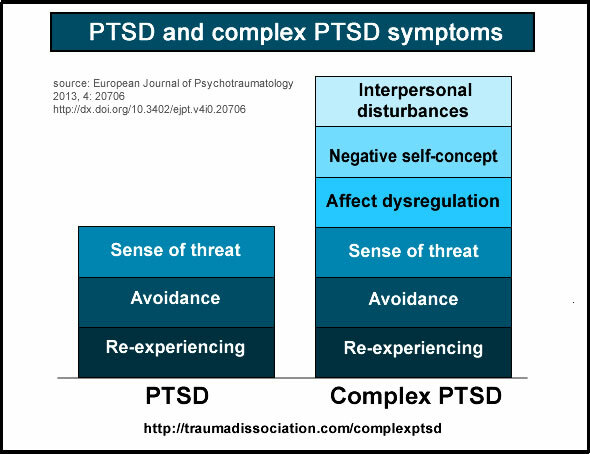 Complex Post-traumatic Stress Disorder, also known as “complex trauma”, is the result of multiple traumatic events occuring over a period of time, for example caused by multiple incidents of child abuse. Interpersonal problems includes social and interpersonal avoidance (avoiding relationships), feeling distance or cut off from others, and never feeling close to another person. The term negative self-concept includes a feeling of worthlessness and feelings of guilt. While survivors of PTSD may feel “not myself”, a survivor of Complex PTSD may feel no sense of self at all or… a few may feel as if they are no longer human at all (Lovelace and McGrady, 1980; Timerman, 1981).:385-386. Recent research has produced detailed analysis of the symptoms of Complex PTSD, PTSD and Borderline Personality Disorder (BPD). Many people with BPD have either PTSD, or meet the proposed criteria for Complex PTSD, but Complex PTSD was shown to be a separate diagnosis because a significant number did not meet the BPD criteria (and vice versa). Code 7B21 “Complex PTSD is a disorder that arises after exposure to a stressor typically of an extreme or prolonged nature and from which escape is difficult or impossible. The current ICD-10 includes a diagnosis of Enduring Personality Change After Catastrophic Experience (EPCACE) in the Disorders of adult personality and behavior section. This is regarded as similar to Complex PTSD. The personality change should be enduring and manifest as inflexible and maladaptive features leading to an impairment in interpersonal, social, and occupational functioning. Usually the personality change has to be confirmed by a key informant. In order to make the diagnosis, it is essential to establish the presence of features not previously seen, such as: a hostile or mistrustful attitude towards the world; social withdrawal; feelings of emptiness or hopelessness; a chronic feeling of being “on edge”, as if constantly threatened estrangement. This personality change must have been present for at least 2 years, and should not be attributable to a pre-existing personality disorder or to a mental disorder other than post-traumatic stress disorder (F43.1). Tagged as: C-PTSD, what is complex PTSD?